We evaluated the changes in expression of androgen receptor (AR) and its variants (ARV) in human prostate cancer (PCa) tissues according to disease status. In addition, it examined the relationship between the AR expression and biochemical recurrence free survival (BCRFS) following radical prostatectomy (RP). A total of 282 cases were evaluated which included 252 localized PCa, 8 metastatic castration resistant prostate cancer (CRPC), and 22 benign prostatic hyperplasia (BPH). Samples from patients who underwent RP or transurethral resection of prostate were collected and stored in ethically approved tissue banks. Polymerase chain reaction (PCR), western blot (WB), and Immunohistochemistry (IHC) were performed for AR and ARV7. Histopathological evaluation was done to determine the type of lesion including Gleason scoring. Each fresh tissue block was divided into 3 sections, both ends were made into paraffin blocks for IHC, and the middle section was divided into two sections for WB and PCR. Each tissue was confirmed as a cancer tissue (more than 80%) using HE stain at both ends paraffin block. Only 58 of localized PCa identified as sufficient tumor tissue and included in the analysis. Using PCR, WB, and IHC, the expression of AR and ARV7 were compared according to disease status (BPH vs localized PCa vs CRPC) and Gleason score (7 vs 8-10). 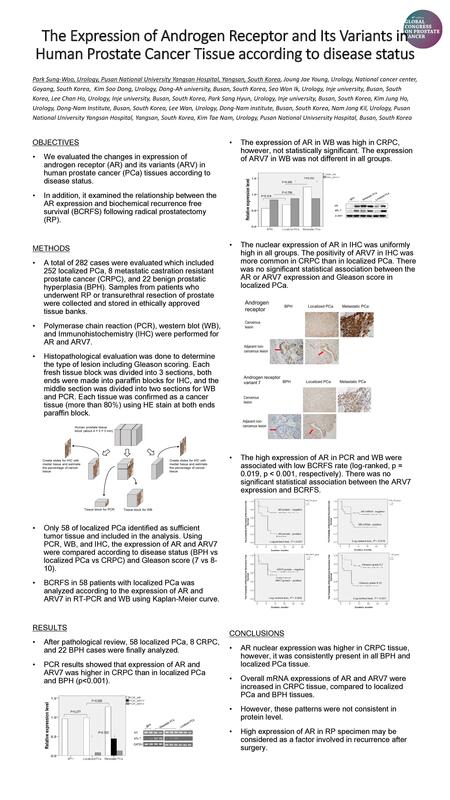 BCRFS in 58 patients with localized PCa was analyzed according to the expression of AR and ARV7 in RT-PCR and WB using Kaplan-Meier curve. After pathological review, 58 localized PCa, 8 CRPC, and 22 BPH cases were finally analyzed. PCR results showed that expression of AR and ARV7 was higher in CRPC than in localized PCa and BPH (p<0.001). The expression of AR in WB was high in CRPC, however, not statistically significant. The expression of ARV7 in WB was not different in all groups. The nuclear expression of AR in IHC was uniformly high in all groups. The positivity of ARV7 in IHC was more common in CRPC than in localized PCa. There was no significant statistical association between the AR or ARV7 expression and Gleason score in localized PCa. 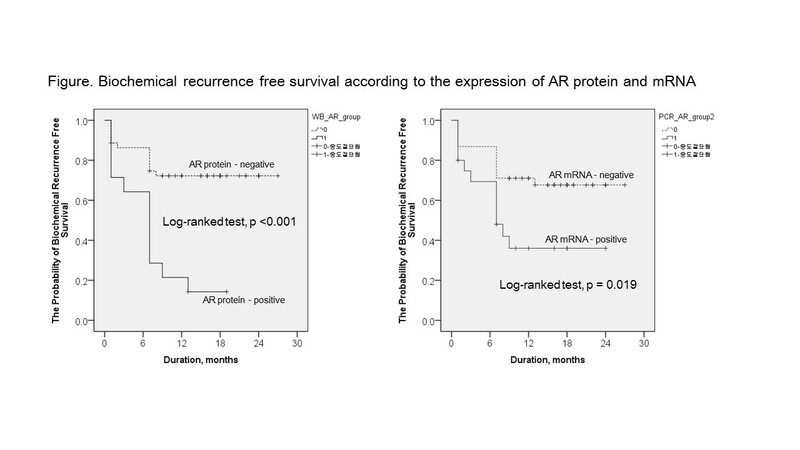 The high expression of AR in PCR and WB were associated with low BCRFS rate (log-ranked, p = 0.019, p < 0.001, respectively). There was no significant statistical association between the ARV7 expression and BCRFS. AR nuclear expression was higher in CRPC tissue, however, it was consistently present in all BPH and localized PCa tissue. Overall mRNA expressions of AR and ARV7 were increased in CRPC tissue, compared to localized PCa and BPH tissues. However, these patterns were not consistent in protein level. High expression of AR in RP specimen may be considered as a factor involved in recurrence after surgery.